Official Product of Ultimate Arms Gear, Brand New. Package Includes: 2 Wood Screw Swivels Steel 1" Wide (One each 1/2-Inch and 3/4-Inch Screws) + Strap. Set of Two Wood Screw Swivels Steel 1" (1 Inch). One each 1/2-Inch and 3/4-Inch Screws. Designed for Straps 1" Wide or Less. All Steel Construction, Black Finish. Super Heavy-Duty Swivels, Will Hold Up To Years Of Heavy Outdoor Use. Quick and Easy Installation. Fits Wood and Most Synthetic Stocks & Forends. 2 White Spacers Included to Insure a Secure Tight Fit and Not Scratch The Rifle / Shotgun. 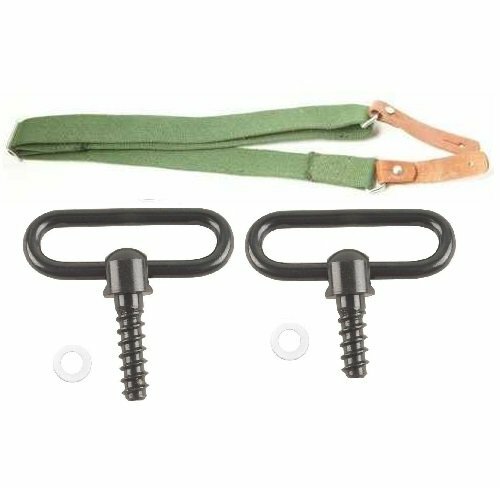 Package Includes: 2 Wood Screw Swivels Steel 1" Wide (One each 1/2-Inch and 3/4-Inch Screws) + Canvas Strap with Leather Tab Ends.